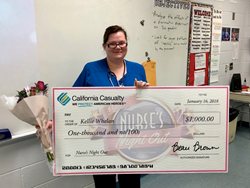 Alloway, New Jersey, RN Kellie Whelen received a $1,000 Nurses Night Out Award from California Casualty. Learn more about auto and home insurance for Nurses from California Casualty at https://mycalcas.com/auto-home-insurance/nurses/. California Casualty protects American heroes, and we want to show our appreciation to the men and women who take care of America. The New Year is starting well for RN Kellie Whelan, who is still in shock after being announced the recipient of a $1,000 Nurses Night Out from California Casualty. “I was so surprised and honored to have received this prize from California Casualty,” she said. Her name was randomly pulled from 11,000 entries received from nurses across the country. Kellie, the school nurse for the Alloway Township School, said working with students and families to improve the health of the school community is her calling. “I have been a school nurse for six years and I truly feel that I have found my passion,” she added. Giving is in Kellie’s nature. “If giving back to those who give is the message, Kellie is such a worthy recipient as she truly serves the school community. Most recently, she has taken a leadership stance on a 'hot topic' in her field. She is a reflective self-starting professional,” said Alloway Township School Superintendent Kristen Schell. The Nurses Night Out award was created to thank RNs and nurse practitioners for the long hours they put in offering comfort and healing to patients and families. Winners can use the $1,000 prize any way they wish: hitting the town in a rented limousine, hosting a party, or taking a relaxing day at the spa. They are only limited by their imagination. Nurse Kellie plans on using most of the funds for a summer vacation tour of the National Parks with her family, but will also treat teachers and staff at the Alloway Township School to a breakfast in the near future. Kellie is also a happy California Casualty policyholder. Headquartered in San Mateo, California, with Service Centers in Arizona, Colorado and Kansas, California Casualty provides auto and home insurance to educators, firefighters, law enforcement and nurses across the country. Founded in 1914, California Casualty has been led by four generations of the Brown family. To learn more about California Casualty, or to request an auto insurance quote, please visit http://www.calcas.com or call 1.800.800.9410. [California Casualty __title__ Auto and Home Insurance for Nurses ].